ZigBee adds the network (NWK) layer and the framework for an application layer to the physical (PHY) layer and the media access control (MAC) sub-layer that are defined in IEEE 802.15.4-2003. The IEEE 802.15.4-2003 has two PHY layers that operate in two separate frequency ranges: 868/915MHz and 2.4GHz. The 868MHz band is used in Europe, the 915MHz band is used in North America. The 2.4GHz range is used virtually worldwide. The IEEE 802.15.4-2003 MAC layer controls access to the radio channel. Its responsibilities include transmitting beacon frames, synchronization, and providing a reliable transmission mechanism. The ZigBee network layer (NWK) supports star, tree, and mesh topologies. In a star topology the network consists of a ZigBee coordinator and end devices. The ZigBee coordinator is responsible for initiating and maintaining the devices on the network. In mesh and tree topologies the ZigBee coordinator is responsible for staring the network and for choosing certain key network parameters, but the network may be extended through the use of ZigBee routers. In tree networks, routers move data and control messages through the network. Tree networks may employ beacon-oriented communication as described in IEEE 802.15.4-2003. Mesh networks allow full peer-to-peer communication. ZigBee routers in mesh networks do not currently emit regular IEEE 802.15.4-2003 beacons. The ZigBee specification only describes networks where communications begin and terminate within the same network. Device discovery and service discovery enable the creation of self-organizing ad-hoc networks. The raw, over-the-air data rate is 250 kbit/s per channel (2.4 GHz band), 100 kbit/s per channel in the 915 MHz band, and 20 kbit/s in the 868 MHz band. Transmission range is rougly 300ft (1mW) and 4000ft (60mW). The basic channel access mode is "carrier sense, multiple access/collision avoidance" (CSMA/CA). In the 2.4GHz band there are 16 channels each requiring 5MHz of bandwidth. IEEE 802.15.4-2003 short (16-bit) and long (64-bit) address modes supported. The majority of the ZigBee application initiatives listed on the ZigBee Alliance website involve the integration and central management of lighting, heating, cooling and security systems in home and industrial environments. An integrated system enables conservation through optimized HVAC management and communication of usage information to the consumer. For lighting systems ZigBee provides an opportunity to quickly create adaptable workspaces and upgrade building infrastructure with minimal effort. ZigBee Home Automation ZigBee Home Automation is the global standard for the control of appliances, lighting, environment, energy management, safety, and security. ZigBee Building Automation Integrate and centralize the management for lighting, heating, cooling and security systems. ZigBee Health Care ZigBee Health Care provides a global standard for interoperable wireless devices enabling secure and reliable monitoring and management of noncritical, low-acuity healthcare services targeted at chronic disease. ZigBee Remote Control Standard for RF control of consumer electronic devices. Offers non-line-of-sight operation, two-way communication and longer range than IR solutions. ZigBee Remote Control is the public application profile for the ZigBee RF4CE specification. Inertial Measurement Systems MEMs sensors integrated in industrial, automotive, military, aviation and marine environments. Environmental Data Collection Agricultural, environmental and conservation studies. Arts and Education Interactive exhibits, games, robotics. XBee Chip 470 ft. 80 ft. Whip 845 ft. 80 ft.
XBee-Pro Chip 1690 ft. 140 ft. Whip 4382 ft. 140 ft. The MaxStream XBee modules are fully integrated modules designed to meet IEEE 802.15.4-2003. The XBee integrates a microcontroller (with ADC and digital I/O), radio and antenna into a 1"x1" module. The modules operate within the ISM 2.4GHz frequency range and can be configured with different antenna and transmitter amplifier options. For outdoor line-of-sight transmissions the range of the 1mW transmitter is over 400feet with a chip antenna. The 60mW transmitter with a whip antenna has a range of over 4000ft. The XBee can be used to create a low cost, low power ZigBee sensor node. Properly conditioned sensors can be connected to the ADC inputs and the XBee can be programmed to periodically alternate between sleep and operate modes. At a Vcc of 3V the maximum sleep current for a cyclic sleep mode is 34uA. The cyclic sleep mode is software controlled using the XBee microcontroller. With external hardware control the XBee can be put in hibernate mode which has a maximum current of 3uA. These low currents are only achieved with a Vcc of 3V. At a Vcc of 3.3V both sleep currents have typical values of 100uA. 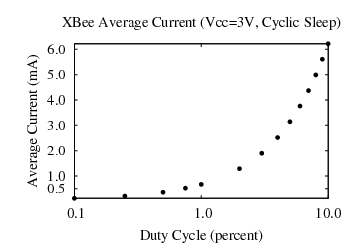 The operating current for an XBee is 50mA. Conservative efficiency and quiescent current estimates for a DC-DC converter to boost two AA cells to 3V would be efficiency > 90% and Iq < 20uA. When the XBee is in operating mode the current drawn from the battery is 62mA. The sleep mode currents drawn from the battery for hibernate mode (SM1) and cyclic sleep mode (SM4) are 23uA and 54uA respectively. 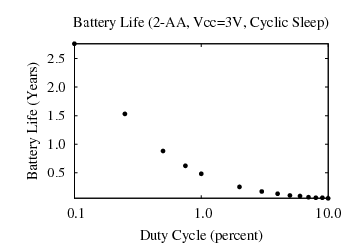 Using 2-AA cells yields a battery life of over 2 1/2 years is possible using cyclic sleep mode (SM4) and a 0.1% duty cycle. For duty-cycles below 1% the average current can be reduced by another 30-40% by changing from cyclic sleep (SM4) to hybernate mode (SM1). This involves additional hardware (which will increase the required current). The DC/DC converter Iq specification is conservative. With a small amount of additional design work it is not unreasonable to expect a 50% reduction in Iq. Change the battery chemistry. Using a Li-ion battery and a 3V regulator yields an efficiency of ≈ 80% but an Iq of a few micro-amps. For low duty-cycle systems this would provide a major reduction in current consumption. Use a system-on-chip solution that enables a lower current cyclic sleep mode. This requires more engineering and possibly RF PCB layout.